Fourteen of the current Top 20 players are entered in the third ATP Masters 1000 tournament of the year. At last, the first clay-court ATP Masters 1000 event of the year has arrived. While it may be easy enough to fast forward a week in anticipation of a Rolex Monte-Carlo Masters final between World No. 1 Novak Djokovic and second seed Rafael Nadal, who has won this Masters 1000 title at the scenic Monte-Carlo Country Club each of the past three years and 11 times overall, both will have to navigate their way through a world-class, 56-player draw if they hope to lift the champion’s trophy on April 21 with the azure beauty of the Mediterranean Sea serving as a backdrop. For starters, the two-time champion Djokovic will open against either 186th-ranked wild card Thanasi Kokkinakis of Australia or No. 41 Philipp Kohlschreiber of Germany, following a first-round bye. A possible quarterfinal against ATP Next Gen champion Stefanos Tsitsipas, seeded sixth, awaits. Keep in mind that Kohlschreiber upset the Serbian at Indian Wells and Tsitsipas beat Djokovic in their only meeting last summer at the Rogers Cup in Toronto. Djokovic’s half of the draw also includes No. 4 seed Dominic Thiem of Austria, No. 8 seed Karen Khachanov of Russia, No. 10 seed Daniil Medvedev of Russia, No. 12 seed Nikoloz Basilashvili of Georgia, No. 16 seed David Goffin of Belgium, and No. 17 seed Kyle Edmund of Great Britain. Meanwhile, as Nadal chases after an unprecedented 12th Monte-Carlo title (he won eight straight from 2005 to 2012 and the last three from 2016 to 2018), beginning against either 40th-ranked John Millman of Australia or No. 23 Roberto Bautista Agut of Spain in the second round, the Spaniard could find himself going up against either No. 29 Grigor Dimitrov of Bulgaria or No. 15 seed Denis Shapovalov of Canada in the third round. Looming in Nadal’s half of the draw are No. 3 seed Alexander Zverev of Germany, No. 5 seed Kei Nishikori of Japan, No. 7 seed Marin Cilic of Croatia, No. 9 seed Borna Coric of Croatia, No. 11 seed Marco Cecchinato of Italy, and No. 13 seed Fabio Fognini. Last year, Nadal became the first player to win a tour-level tournament 11 times when he won at Monte-Carlo. He repeated the feat at Barcelona and Roland Garros. Entering this year’s Monte-Carlo Masters, Nadal has won an Open Era-record 57 clay-court titles and his winning percentage is a remarkable 92 percent (415-36). Nadal will be making his first appearance since cutting his winter hard-court season short last month due to a knee injury when he withdrew from the BNP Paribas Open in Indian Wells prior to his semifinal match against Roger Federer. Fourteen of the Top 20 players in the world are competing at the third ATP Masters 1000 touranment of the year, which has been won by either Nadal or Djokovic 13 of the past 14 years. 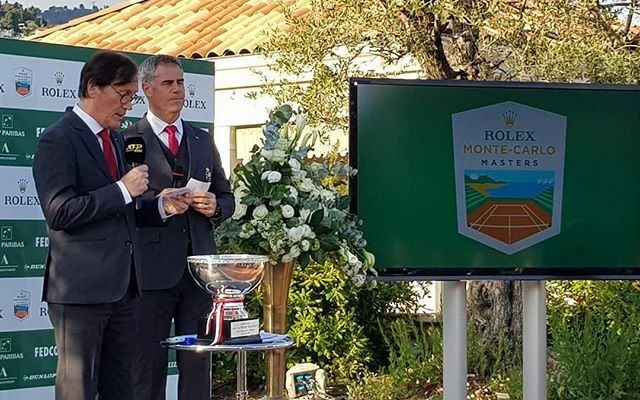 The Rolex Monte-Carlo Masters will award total prize money of €5,885,030 – including €958,055 to the winner plus 1,000 ATP points. There’s no shortage of outstanding first-round matches. Here are a few worth paying attention to: No. 24 Diego Schwartzman of Argentina versus No. 17 seed Edmund (who was seeded after No. 14 seed Gaël Monfils withdrew with a right ankle injury), No. 12 seed Basilashvili versus No. 37 Marton Fucsovics of Hungary, and No. 36 Stan Wawrinka of Switzerland versus No. 31 Lucas Pouille of France. Looking ahead a round, assuming No. 33 wild card Felix Auger-Aliassime gets past a qualifier, he would face No. 3 seed Zverev. • On Saturday, former Monte-Carlo champion Stan Wawrinka and World No. 5 Dominic Thiem took on the role of team captains in a fun-filled exhibition that benefited the Monaco Red Cross. Wawrinka led a team of French-speaking players, which included Lucas Pouille, David Goffin and Daniil Medvedev. Joining Thiem’s team were Stefanos Tsitsipas and Karen Khachanov. The Match Tie-Break included a series of two-on-one points as well as playing with the opposite of their dominant hand. With two-handed backhands banned on match point, Wawrinka’s team won 10-7. • Sunday’s main draw order of play includes: Hubert Hurkacz of Poland versus Borna Coric of Croatia, Matteo Berrettini of Italy versus Grigor Dimitrov of Bulgaria, Lucas Pouille of France versus Stan Wawrinka, and Laslo Djere of Serbia versus Guido Pella of Argentina. Also, there are four first-round doubles matches taking place, including No. 3 seeds Jamie Murray of Great Britain and Bruno Soares of Brazil versus Rohan Bopanna of India and Dominic Inglot of Great Britain. In addition, there are seven qualifying draw singles matches scheduled to round out the main draw. • World No. 8 doubles pair Pierre-Hugues Herbert and Nicolas Mahut, both of France, are top-seeded in 32-team doubles draw. There are two other Top 20 teams entered: No. 2 seeds Lukas Kubot of Poland and Marcelo Melo of Brazil, ranked 10th, and No 3 seeds Jamie Murray of Great Britain and Bruno Soares of Brazil, ranked 17th. This entry was posted in ATP Tour, ATP Tour News and tagged ATP Tour, Monte Carlo Rolex Masters.